Defending champion Real Esteli (LSB) tabbed 30-year old Jamaican power forward Kevin Foster (203-104kg-89, college: Fresno State, agency: Haylett Sports). He played in the summer at Tampa 20/20 (The Basketball Tournament) in the U.S. Foster managed to play in three leagues in two countries last year (!!!). First he played at Hispano Americano de Rio Gallegos (LigaA) in league where in 9 games he averaged 11.3ppg and 6.6rpg. Foster also played for the Wolves in NBA. In only one game he had 5 points, 1 steal and 1 block. The other team he played that season for were the Magic in NBA. In 20 games he recorded 3.9ppg and 2.1rpg. In 2013 Foster was drafted by Reno Bighorns (D-League) in second round (19th overall). The former Fresno State staris in his sixth season in pro basketball. Among other achievements Foster won Venezuelan LNB championship title in 2016. He received also Latinbasket.com All-Venezuelan LNB Imported Player of the Year award and Latinbasket.com Venezuelan LNB All-Imports Team award back in 2016. Foster is a very experienced player. He has played also professionally in Canada (Titans), Dominican Rep., Dominican Republic (Huracanes del Atlantico and Cupes), ABA (Tampa Bay R., South Florida Gold and Daytona B. S.), Venezuela (Broncos) and NBA G League (Lakeland Magic). #1. This week's number one is an experienced former international center Jerome Jordan (215-86, college: Tulsa, currently plays in Spain). Jordan led Andorra to a victory against the league outsider Gipuzkoa (5-19) 84-72 in the Spanish Liga Endesa last Saturday. He recorded 12 points, 7 rebounds and 2 blocks. MoraBanc Andorra (14-12) is placed sixth in the Liga Endesa. It was his team's third consecutive victory in a row. This season Jordan averages: 7.5ppg, 2.3rpg, 2FGP: 51.1% and FT: 63.0%. He played for the Jamaican senior national team five years ago. #2. Second place goes to former international power forward Samardo Samuels (206-89, college: Louisville, currently plays in France). Samuels could not help Limoges CSP Elite (12-12) in their last game. Despite his very good performance Limoges CSP Elite lost 83-88 on the road to the higher-ranked (#7) Gravelines-Dunkerque. Samuels was the second best scorer with 15 points. He also added 4 rebounds in a mere 17 minutes. It was Limoges CSP Elite's fourth consecutive loss in a row. It's Samuels' first season with the team. This year Samuels' overall stats are: 10.0ppg, 4.0rpg, 1.2apg, 2FGP: 56.9%(70-123), 3FGP: 37.5% and FT: 66.3% in 21 games he played so far. He played for the Jamaican national team in 2014. #3. The Jamaican player who performed third best last week abroad was former international power forward Adrian Uter (201-84, agency: BeoBasket, college: Hofstra, currently plays in Puerto Rico). Uter led Leones to a victory over one of league's weakest teams Indios (3-7) 99-89 in the Puerto Rican BSN last Wednesday. He was MVP of the game. Uter recorded a double-double by scoring 24 points and getting 11 rebounds. He also added 2 blocks. Leones de Ponce (6-2) is placed third in the BSN. It was his team's third consecutive victory in a row. But this is still an early stage of the season and everything may happen. Uter has relatively good stats this year: 11.8ppg, 7.4rpg, 1.9apg, 1.5bpg, 2FGP: 71.7%(38-53), 3FGP: 16.7% and FT: 93.8%(15-16). He is a naturalized American. Uter played for the Jamaican national team six years ago. #4. Point guard Dylan Ennis (187-91, also represented by BeoBasket, college: Oregon, currently plays in Spain) is a teammate of previously mentioned Jerome Jordan and both played together in the last Spanish Liga Endesa game. 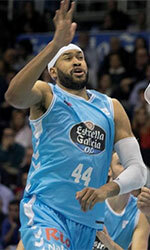 Ennis managed to help MoraBanc Andorra in a victory against the league outsider Gipuzkoa (5-19) 84-72. He recorded only 2 points, 5 rebounds and 4 assists in 21 minutes. This year Ennis has relatively solid stats: 14.1ppg, 3.2rpg and 2.8apg in 25 games. He has a dual citizenship: Canadian and Jamaican. Ennis used to play for the Jamaican national team back in 2014. #5. Former international center Kevin Young (206-84, college: Missouri, currently plays in Uruguay) was the major contributor in Bigua's victory against the leader Malvin (4-1) 87-78 in a derby game in the Uruguayan LUB in Monday night's game. He scored 12 points and grabbed 8 rebounds. It was the game of the round between two top 3 ranked teams in group Places 7-10. Atletico Bigua Montevideo (4-2) is placed first. Young's total stats this season are: 7.2ppg, 5.7rpg and 1.2apg. He used to play for the Jamaican national team thirteen years ago. #6. Small forward Ricardo Alliman (201-87, college: Cedarville, currently plays in France) was the main contributor in a Orchesien BC's victory against the eighth-ranked Rueil (4-7) 81-77 in the French NM1 (third division) in Saturday night's game. Alliman was the best player in that game. He scored 24 points and grabbed 8 rebounds in 34 minutes. BC Orchies (4-7) is placed seventh in Places 1-10 group. Alliman has reliable stats this year: 14.7ppg, 6.8rpg and 1.1apg in 29 games. Worth to mention he played also at Eurobasket Summer League, which helped him get the job in pro basketball. He is a former international player as he played for the Jamaican senior team five years ago. #7. Former international swingman Weyinmi Rose (196-86, college: Providence, currently plays in Puerto Rico) is a teammate of previously mentioned Adrian Uter. But that was another game of his team in Puerto Rican BSN which we would like to mention. Rose contributed to Leones' victory against the closely-ranked Cariduros (5-6) 112-107. He scored only 2 points. Leones de Ponce (6-2) is placed third in the BSN. It was his team's third consecutive victory in a row. Rose's total stats this season are: 4.5ppg, 1.3rpg and 2.0apg. He used to play for the Jamaican national team five years ago. #8. Center Vashil Fernandez (208-92, college: Valpo, currently plays in Spain) contributed to Marin's victory against the leader HLA Alicante (23-5) 64-56 in the Spanish LEB Silver (third division) in Friday night's game. Fernandez recorded 8 points, 5 rebounds and 2 blocks in 21 minutes. Marin PeixeGalego (15-13) is placed fourth in West group. This year Fernandez's total stats are: 8.2ppg, 7.0rpg and 2.2bpg in 25 games. He is a naturalized American. Fernandez used to play for the Jamaican national team back in 2014. #1. Sek Henry (193-G-87, college: Nebraska, currently plays in FIBA Europe Cup) could not help Pinar Karsiyaka (3-3) in their last game. Despite his very good performance the second-placed Pinar Karsiyaka (3-3) was edged 83-83 on the road by the leading Banco di Srd in the group I of FIBA Europe Cup. Henry scored 24 points, 5 passes in 30 minutes. It's Henry's first season with the team. He has individually a very good year with high stats. Henry averages: 17.4ppg, 2.7rpg, 4.9apg and 1.1spg in 16 games he played so far. He is a naturalized American. #2. Shevon Thompson (213-C-93, college: GMU, currently plays in Belgium) was the major contributor in Oostende's victory against the closely-ranked Basic-Fit Brussels (13-9) 83-68 in the Belgian Euromillions League on Monday night. Thompson recorded 17 points and grabbed 5 rebounds in 25 minutes; quite an impressive performance considering it's only his third season in pro basketball. It was the game of the round between two top 4 ranked teams. Filou Oostende (17-4) is placed first in the Euromillions League. It was his team's sixth consecutive victory in a row. Thompson has very impressive stats this year: 16.5ppg, 5.0rpg and 1.5spg in two games. #3. Ryan Martin (206-F-91, college: Tenn Tech, currently plays in Denmark) led Bakken to an easy victory against the fourth-ranked Vaerlose (2-4) 90-71 in the Danish BasketLigaen in Sunday night's game. He scored 17 points; not bad, considering it's only Martin's third season in pro basketball. Bakken Bears (22-2) is placed first in ProA group. Martin has relatively good stats this season: 13.3ppg, 5.1rpg and 1.6apg. He has a dual citizenship: Jamaican and British. Despite Martin's Jamaican passport, he previously played for the British U20 national team and is probably not eligible to play for the Jamaican team. #4. Brynton Lemar (193-G-95, college: UC Davis, currently plays in Hungary) led Sopron KC to a victory over the closely-ranked Alba (11-14) crushing them 87-65 in the Hungarian A Division on Sunday night. Lemar was MVP of the game. He recorded 27 points (!!!). Sopron KC (11-14) is placed 11th in the A Division. Lemar's team will play only one more game in the Regular Season. And that game will be critical. This season Lemar has very high stats. He averages: 17.6ppg, 3.3rpg and 2.9apg. Lemar is a naturalized American. #5. Staphon Blair (206-F-93, college: Cent Florida, currently plays in Portugal) was the main contributor in Illiabum's victory against the leader CAB Madeira (11-15) 80-75 in the Portuguese LPB in Friday night's game. He was MVP of the game. Blair had a double-double by scoring 26 points and getting 13 rebounds. He also added and 3 steals in 35 minutes. It was the game of the round between two top 3 ranked teams in group Places 7-12. Illiabum Clube (10-15) is placed second. Blair has relatively good stats this year: 13.2ppg and 8.4rpg in 25 games. He is a naturalized American. #6. Ryan Rhoomes (203-C-92, agency: Duran International, college: Fordham, currently plays in France) was not able to help Saint-Quentin (8-3) in their last game. Despite Rhoomes' good performance the third-placed Saint-Quentin was edged 75-73 in Le Havre by the lower-ranked (#5) STB Le Havre in the Places 1-10 group. He was the second best scorer with 11 points. Rhoomes also added 7 rebounds and dished 5 assists in 28 minutes. Rhoomes has very impressive stats this year: 16.1ppg, 7.2rpg and 1.5apg in 29 games. He is a naturalized American. #7. Quintrell Thomas (203-PF-90, college: UNLV, currently plays in Israel) was not able to secure a victory for Hasharon (10-16) in their last game on Tuesday. Despite Thomas' very good performance Hasharon was defeated 101-96 in Haifa by the much higher-ranked Maccabi (#4). He recorded a double-double by scoring 23 points and getting 10 rebounds (made all of his eleven free throws !!!). This season Thomas has very high stats. He averages: 23.5ppg, 12.2rpg and 1.4bpg. Thomas is a naturalized American. #8. Joel Wright (201-F-90, college: Texas St., currently plays in Switzerland) contributed to Monthey's victory against the fifth-ranked Neuchatel 92-78 in the Swiss SBL last Saturday. Wright was the top player that evening. He scored 19 points, grabbed 6 rebounds and dished 4 assists. This season Wright has very high stats. He averages: 18.2ppg, 4.5rpg, 2.8apg and 1.6spg. Wright is a naturalized American. #9. Ryan Harrow (188-G-91, college: Georgia St., currently plays in Greece) managed to help Peristeri GS Athens in a victory against the league leader Panathinaikos 80-72 in a derby game in the Greek A1 on Sunday night. He scored only 4 points and added 3 assists in 17 minutes. Harrow's stats this year are: 13.0ppg, 2.4rpg and 4.9apg in 17 games. He is a naturalized American. #10. Daniel Mullings (189-G-91, college: N.Mexico St., currently plays in Finland) contributed to a Joensuun Kataja's victory against the ninth-ranked Lapuan Korikobrat 87-74 in the Finnish Korisliiga in Wednesday night's game. Mullings scored 6 points, had 6 rebounds and dished 5 assists. This season Mullings has very high stats. He averages: 15.5ppg, 7.6rpg, 2.6apg and 2.3spg. Mullings is another player who holds two passports: Canadian and Jamaican.